My high school drama teacher must have liked me. That's the only reason I can explain why she cast me in the ensemble of our school show, an obscure little musical called "The Boyfriend." After all, I couldn't sing on key, and my dancing skills were negligible. The perfect, peppy, pretty cheerleaders who also auditioned earned the majority of the stage time, while the choreographer positioned me way in the back, where the audience might not see me turn right while my fellow dancers turned left. But still. I had fulfilled a childhood dream. I became an actress in a musical! The experience introduced me to the castmate camaraderie that comes with being a part of a show. Those perfect, peppy cheerleaders, girls I had viewed (I hate to admit) with envy, became my friends. What's more, I discovered a newfound sense of self-esteem that would stay with me throughout senior year, through college, and beyond. That's why, in the spring of 2011, when my 7th grade daughter Melissa told me she wanted to attend summer drama camp, I could barely contain my excitement. As she prepared to audition for the camp show, The Music Man, I knew that my cherub had one advantage over the high school version of her mom....the girl could sing. But still, as one of the youngest members of the cast who had no prior experience - like the high school version of her mom - my baby took her rightful spot way in the back. But still, it didn't matter! Even though my offspring's stage debut found her hidden behind the other 3,492 drama campers who belt out The Music Man's signature showstopper, "76 Trombones", my husband Bob and I still attended every single performance. As a thank you for her participation in the show, (and as part of the summer drama camp fee) my little actress received a t-shirt to commemorate the experience. Moments that, like her first school show. I embraced with the unbridled enthusiasm that comes with being a mom, watching from the sidelines as she celebrated the milestones of her life. Moments that, all too soon, seemed to slip away. A few months ago, again unbeknowst to me, Melissa (with Bob's help) packed up all of her old t-shirts and shipped them off to North Carolina. Those t-shirts landed in the skilled hands of my niece Amanda, who, with help from my nephew Nick's fiance Kimmie, worked magic with a sewing machine. But not just any quilt. 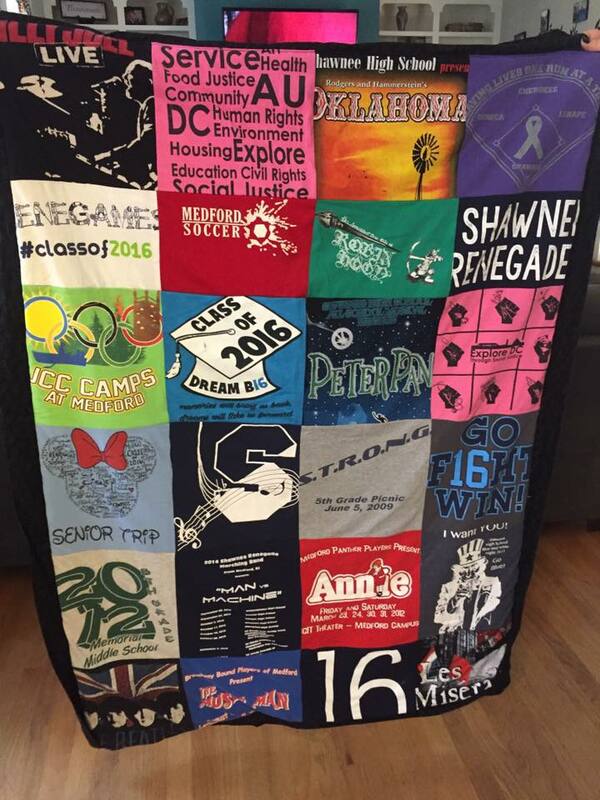 A quilt made up of every one of those t-shirts. 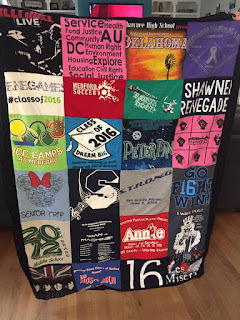 A quilt that captures my daughter's journey from a shy elementary school student to the talented, confident young woman she has become today. When I wrap that quilt around me, I capture all of those moments that seemed to have slipped away. I capture Melissa' passion. I capture her spirit. When I wrap that quilt around me - a gift given from daughter to mother with love - I capture my baby's heart and keep it close to mine. If you like my stories, please tell me in the comments section below.